No, I didn't fall off the face of the Earth, but I have been traveling a lot and also occasionally dealing with migraines. I thought these new glasses would help but instead I suspect they're making it worse. Hope to get back to regular blogging again by September. Synopsis (from Indiebound): Clayton feels most alive when he's with his grandfather, Cool Papa Byrd, and the band of Bluesmen--he can't wait to join them, just as soon as he has a blues song of his own. But then the unthinkable happens. Cool Papa Byrd dies, and Clayton's mother forbids Clayton from playing the blues. And Clayton knows that's no way to live. Why I recommend it: Knowing up front that Cool Papa is going to die doesn't make it any less heartwrenching, but there are still many uplifting moments in this touching little gem of a novel. Short chapters and spare lyrical language make it a smooth and easy read. 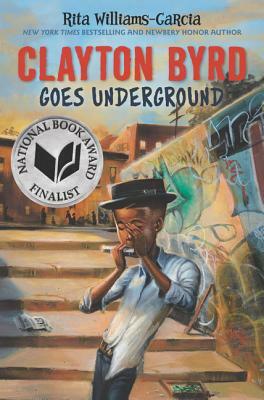 Clayton is a likable character and you'll find yourself pulled in as he goes underground, in both senses of the word. Rita Williams-Garcia is the talented author of One Crazy Summer and other books.